After more than 15 years away from my home country I decided it was time to pay a visit. Isabelle has been growing up speaking Russian, and I thought it was time to take her to a place where everyone from shop assistants to little kids on playgrounds to bus drivers and police spoke in a tongue that she mostly only heard from me, her mom, up until now. Of course, preparing for a visit to Russia is not a trivial task. We had to spend almost a year getting various travel documents in order. That involved reinstating my Russian citizenship, renewing my expired passport, going twice to the Russian consulate in Seattle, spending countless hours with various agencies on the phone, and getting Isabelle a Russian visa. 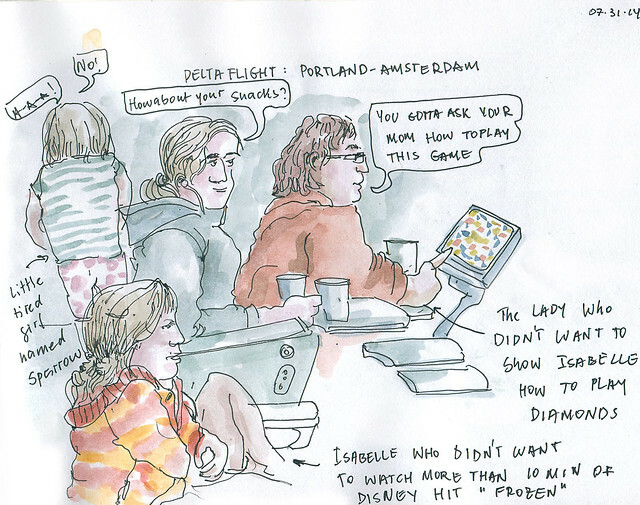 Here we are trying to stay entertained by sketching, eating in-flight snacks, and watching other passengers watch their movies on a long flight from Portland to Amsterdam. 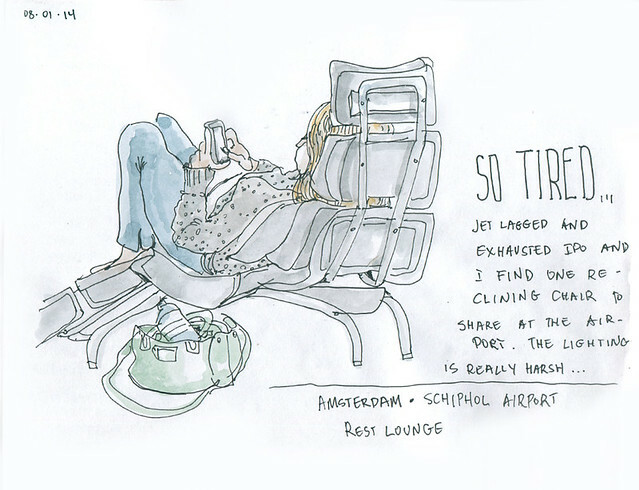 Finally coughed out of the plane on the other side of the Atlantic we are trying to catch a few minutes of sleep in the Schiphol airport during our layover in Amsterdam under the harsh fluorescent lights and incessant boarding announcements. Next morning we find ourselves in my friend Olga's apartment. 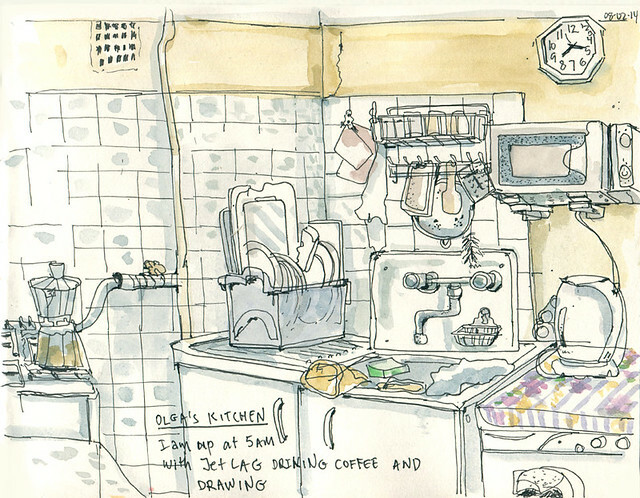 I wake up early from jet lag and venture to the kitchen to do this sketch while sipping my morning coffee. I love finding myself in a Soviet style kitchen once again where from a strategically placed stool (taburetka) you could reach and get something out of a fridge, turn on the stove or wash something in a sink without getting up. So many countless conversations, gossips and jokes, not to mention, fierce political arguments were shared here! 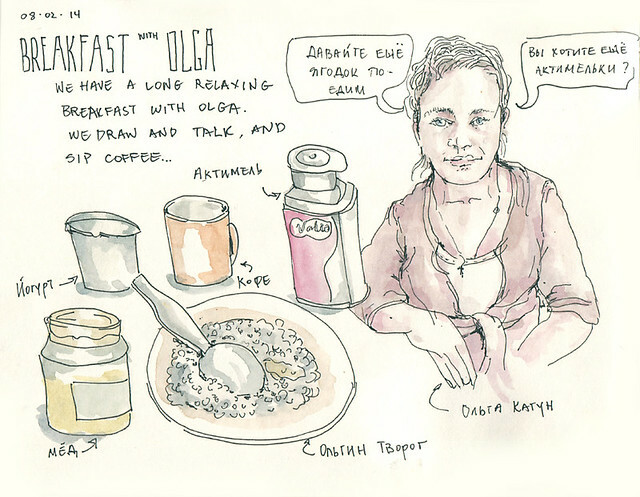 Olga is a very attentive host and pours a variety of breakfast options in front of us. Soon we relocate to the historic center, renting a lovely apartment on the corner of two rivers. The view from the our mansarda on Fontanka is to die for. It makes up for the noise of tour boats passing in herds underneath, for the merciless mosquitos, for the hot August sun that blasts through our roof top windows, and for the lack of curtains that make sleep almost impossible as it is light out from 5 am till midnight. 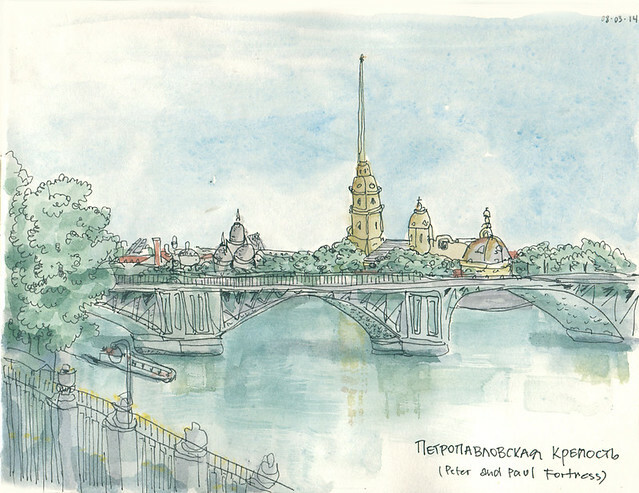 Here is the view of the famous Peter and Paul Fortress from our window early in the morning when the river is still fairly peaceful. 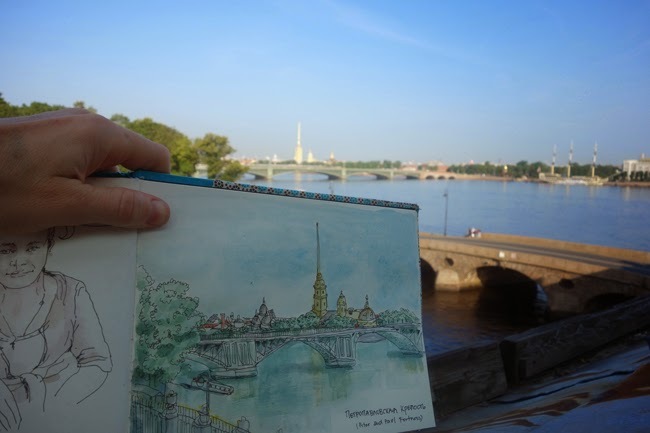 The rest of the day and night we live to the constant mumbling of the tour guides glorifying various monuments along the banks of Neva and Fontanka rivers amplified by the onboard microphones and distorted by the thick granite walls of the canal. 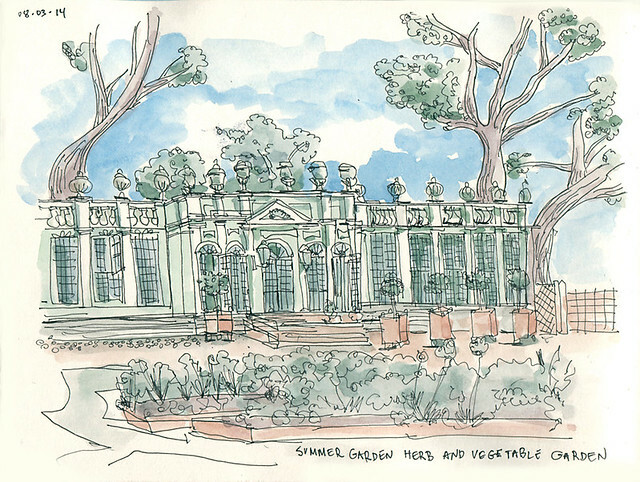 We are also lucky enough to be living right across from the infamous Summer Gardens and Peter the Great's Summer Palace – a very humble structure as far as palaces go. 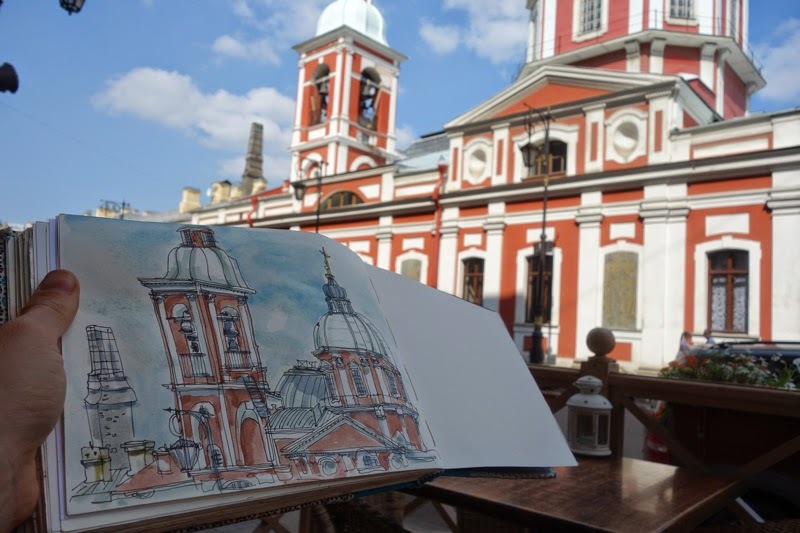 We seek almost daily refuge at the Botanika cafe on Pestel's Street – a vegetarian café that smells of wheat grass and features the view of the lovely St Panteleimon Сhurch. 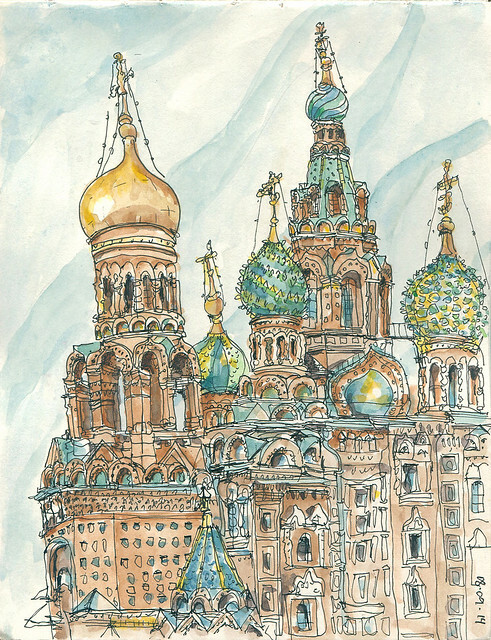 I end up drawing this church three times as Isabelle wants her own version to color, but that drawing ends up being sized by another girl who throws a fit when they argue who gets to have it. See below. 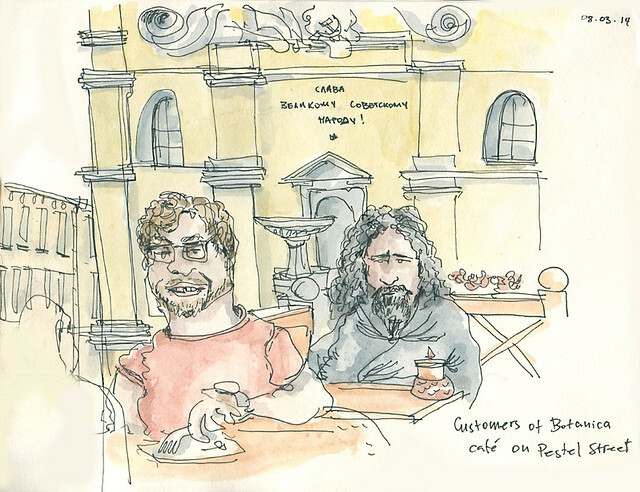 Botanika has a customer who is even more loyal to the café – a Rasputin looking character who apparently finds the smell of wheat grass equally addictive. Every time we are there – there he is wearing his black tunic meditating over a glass of beet juice for countless hours. The words on the building behind him read: "Glory to the Soviet People!" which look especially anachronistic here on Pestel's street, with scores of well to do westernized Russians trying to detach themselves from any reminders of the Soviet era deprivation, and yes, this monk looking character occupying my view finder. 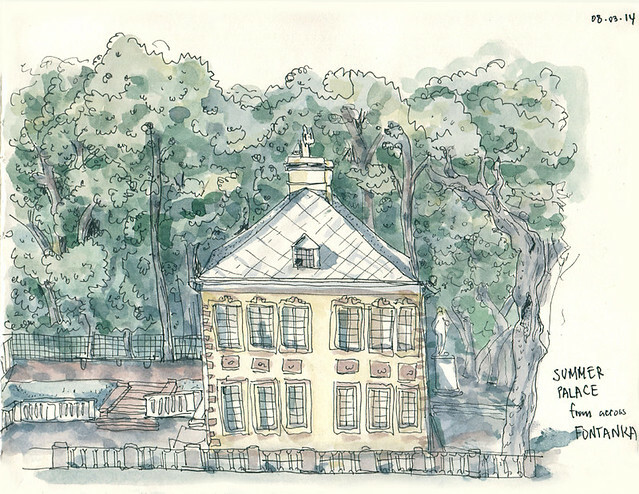 Our other favorite refuge in the midst of the relentless August heat wave is Petersburg's parks. While being incredibly pretty Summer Garden is not the most relaxing option. These days it works more as a photographic backdrop to the endless procession of wedding parties who waltz through its allies to the hum of snapping cameras. A park goer who is careless enough to actually come in closer contact with nature, be it by stepping on the grass, touching a plant, or sticking a finger in one of its many fountains gets a loud reprimand in a form of a loud whistle from one of the much feared Russian babushkas/park attendants. You can buy some overpriced coffee from this Pavilion and enjoy it from the civility of a bench nearby while being entertained by the "whistle police" reprimanding clueless park goers who are constantly testing the limits of babushka's patience. We, in turn, get reprimanded by Olga for dining in one of the restaurants that weren't previously approved by her. 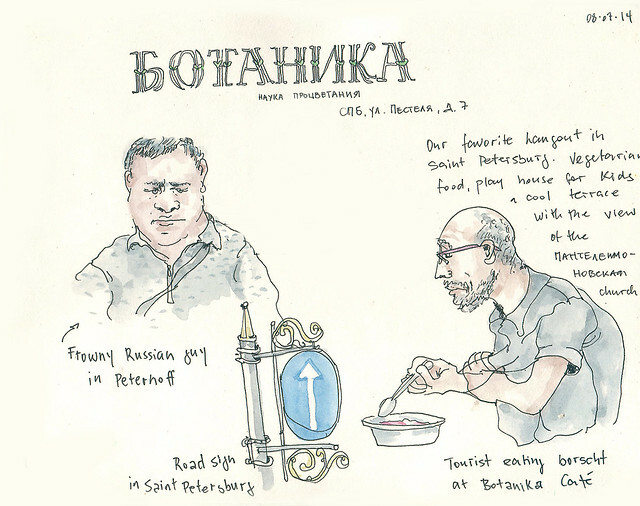 The restaurant Yakitoria (Ostrovsky square, 5) has an identity crisis that manifests itself by having six separate menus dedicated to completely different world cuisines. Typically, anywhere else in the world a restaurant that offers both borscht and sushi, both displayed in giant glossy menus and accompanied by larger than life photographs would mean one is guaranteed to leave dissatisfied, here in Russia, following its own logic – everything we order is incredibly delicious. Olga does recommend that we buy coffee only from the coffee shop called Kafe na Kuhne with a view of Fontanka – of course, she is right – it is quite good. The walls even feature certificates of achievement given to this shop's baristas at Russian barista competitions. 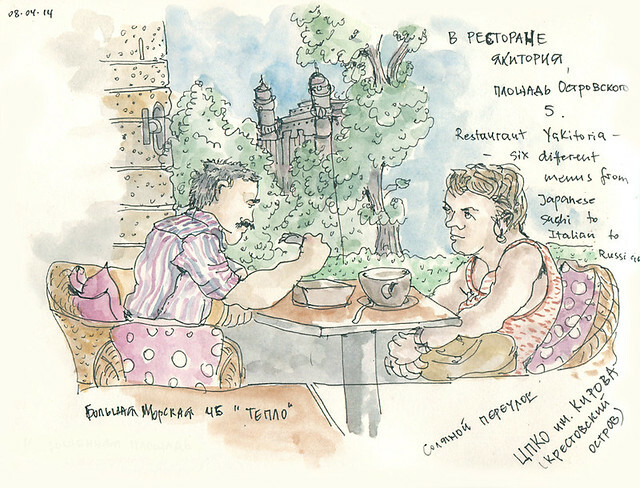 Kafe na Kuhne is where Isabelle meets Zoya, a little girl who upon seeing my line drawing of Panteleimon Сhurch (see above) starts a fierce battle about who gets to color it. I tell Isabelle to yield in the interest of peace and promise I will do another drawing of the same church for her later. 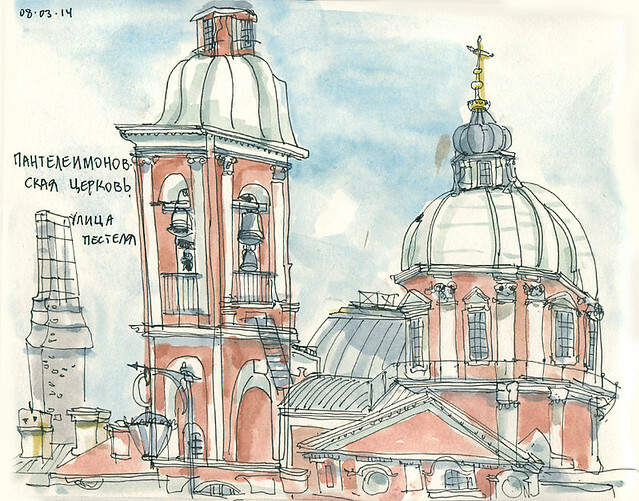 Fragile truce prevails as we watch Zoya apply thick layers of color with her purple and orange markers to the church's cupolas. 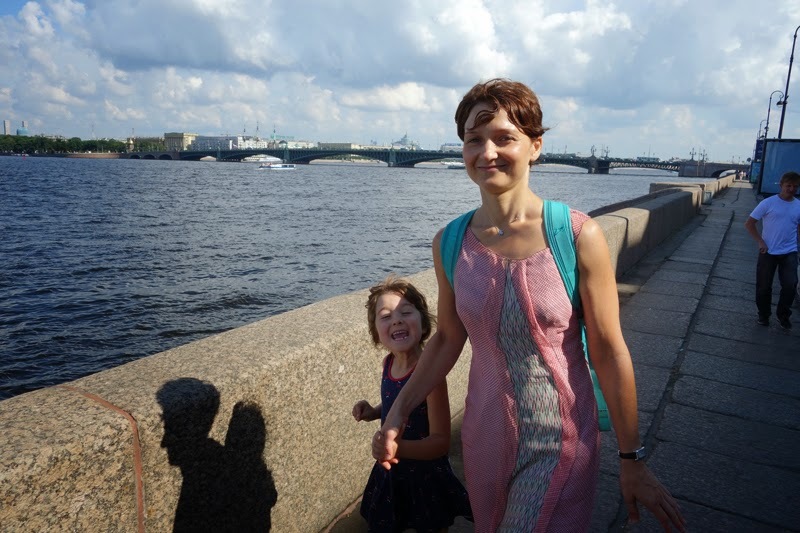 Zoya's mom – Tatyana becomes a quick friend showering us in endless recommendations of kid friendly places to visit in Petersburg. I try to politely write down all of the various addresses that bubble out of her but then soon give up. The two offer us a ride to Tavrichesky Sad, another park I used to frequent as a child. We decide to walk there instead. Tavrichesky Sad Park was a perfect choice for this hot afternoon. 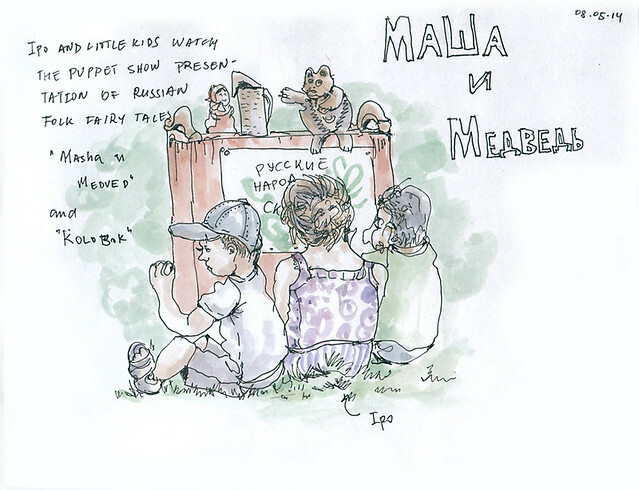 There is a free puppet show of Russian folk fairy tales right on the lawn. 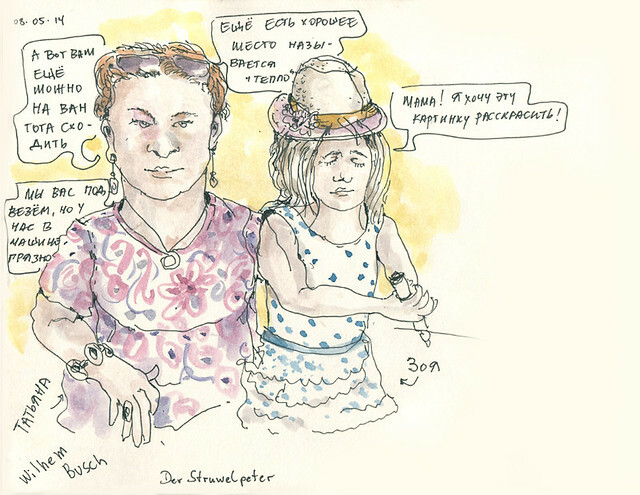 Isabelle is not only entertained but also fed by our Russian fairy godmother – Olga who meets us in the park with a takeout pizza. Best of all, there are no security cameras, whistles, or strict park rules – we could stretch out and take a nap in the shade of this lovely park. 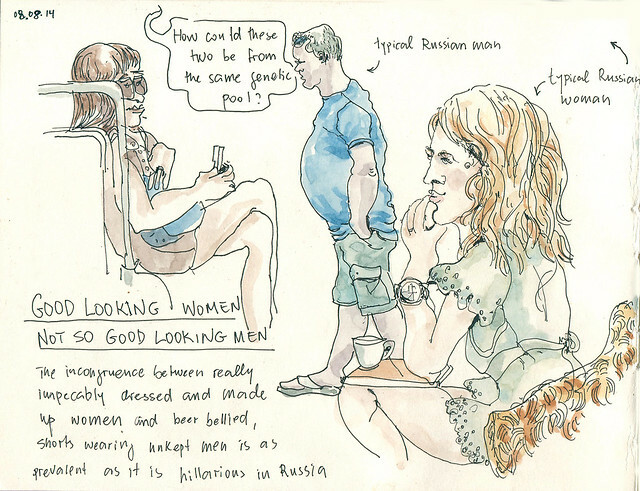 Even not the most keenly observant visitors to the country are stricken by the mismatch between the Russian women and Russian men. The former tend to be beautiful and fit, perfectly made up (even if doing a quick run to a grocery store), dressed for a runway prancing around playgrounds (as either moms or nannies) on their 5 inch stilettos. The latter are often dressed in a pair of frumpy shorts and flip flops, carrying a beer belly and a plastic bag with more beer they often end up clumsily trailing behind their partners, who are usually half their age. What gives, or in the words of one of the Russian-American woman I know "How could these two be from the same genetic pool?" 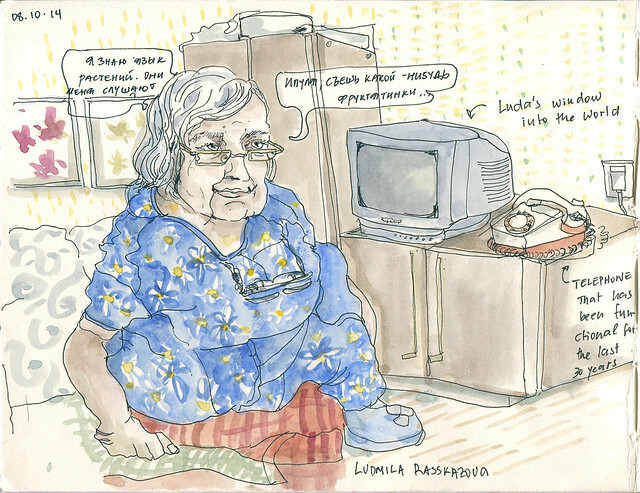 One of the main reasons we came to Russia is my grandmother, Ludmila Rasskazova. 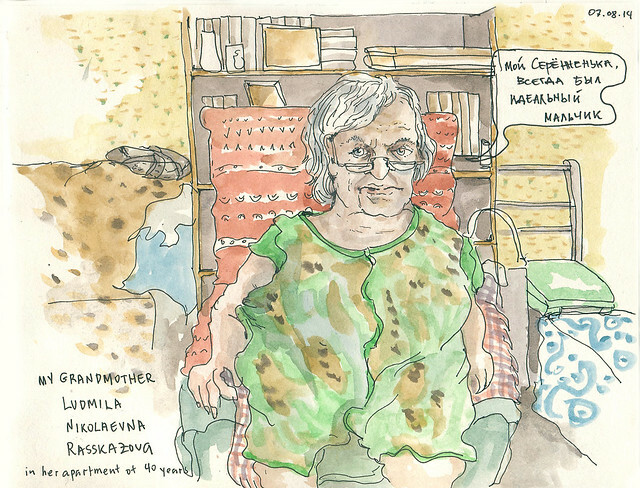 She is the only blood relative I have who is still living there in her tiny Soviet style apartment of 40 years, as always singing praises to her son, her "diamond" (my dad). 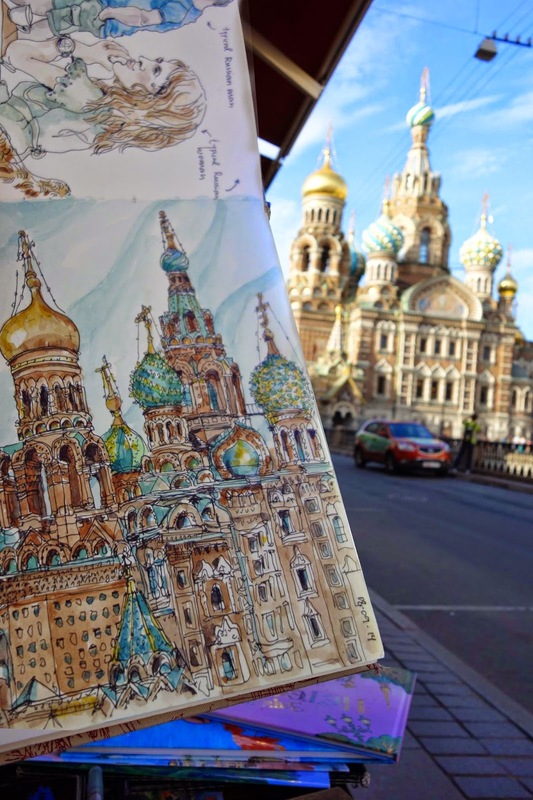 This iconic church was constructed at the site of a ninth or tenth assassination (unfortunately successful one) on a very progressive Russian tsar Alexander II who among many other reforms emancipated the surfs, abolished capital punishment, and promoted higher education. He is also the tsar who sold Alaska to the United States. The church was badly looted and damaged after the revolution, was used as a morgue during the Second World War. Then as a final categorical insult, served as a vegetable wearhouse during Soviet times. Now it is completely restored to its former glory with the interior mosaics are even more stunning than the ornate exterior. This is the only longer drawing I was afforded during our trip. It cost me multiple lemonades and ice creams that I used to bribe Isabelle for sitting next to me for almost two hours.